Tens of thousands gathered on the Great Lawn in Central Park on Saturday, (Sept 23rd) for the Global Citizen Festival. 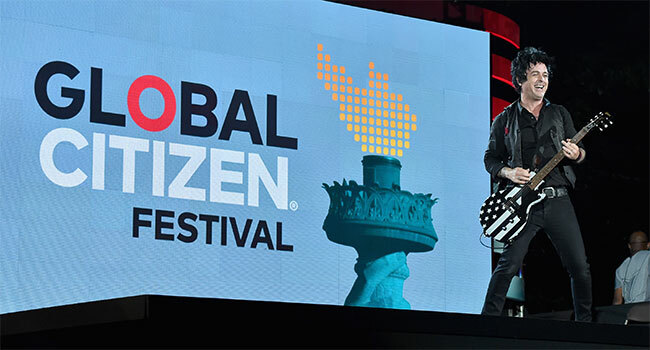 Each year, the festival brings major headliners to New York City to celebrate Global Citizen’s many world-changing missions. Among them, making sanitation available developing nations, access to HIV medication, and the organization’s cornerstone mission: ending global poverty by 2030. Blending live music with advocacy, the festival’s crowd must earn their way into the all-day event by performing social actions. Ticket draws occurred throughout the summer and into this week. The more actions people took, the more their names were entered. This ensures that the annual festival serves as a reward for those who seek to make the world a better place. Headliners for this year’s festival included Stevie Wonder, Green Day, The Killers, The Lumineers, and featured The Chainsmokers. Big Sean, Andra Day and Alessia Cara made special appearances earlier in the day. Pharrell Williams joined Stevie Wonder on stage at the end of the concert. Occurring in the shadow of the annual United Nations General Assembly, the organizers of the festival purposely plan it so that world leaders are already in town and available to stop by Central Park. While the world leaders present were too numerable to mention, the atmosphere lent itself to a kind of down-to-earth honesty. The calls to action for clean water, social justice, and gender rights did not sound at all like platitudes. Rather, they sounded like leaders trying to do their very best, and acknowledging that change is in the hands of the people who take action. While the breaks to talk about issues were sometimes as long as the concert portions, it was not to the detriment of the event. Global Citizen Festival is marketed as a concert, but to be there is to see something more. It is an example of the ‘coming together’ that is fetishized ad nauseam on social media, but so rarely demonstrated in real life. The Lumineers and The Killers had awesome-if brief-sets. While their music was as good as in any show, the afternoon sets themselves suffered from an unavoidable environmental issue: the aggressively bright sun was causing many in the crowd to overheat. At some point during the day, the events producer insisted that water bottles be distributed for the safety of attendees, to the crowd’s loudest cheers of the day thus far. By the time 2x Grammy winner Andra Day took the stage, the sun had started to set and the crowd settled in comfortably. Her powerful vocals grabbed the crowds attention and pulled focus back to the stage. Then, the Chainsmokers built up the energy during their short four song set. But the top spot was saved for a man whose music has literally transcended the decades. Stevie Wonder took the stage shortly before 8:30, and played till almost 10 at night. When you have released “amazing albums every decade,” as Pharrell Williams said while heaping praise on the legend, picking out what hits to play can be a hard thing to do. But, Mr. Wonder knew exactly what the crowd wanted to hear. He even included “Isn’t She Lovely,” a song he rarely plays live, but chose to do as his daughter-and the song’s inspiration-Aisha joined him on stage. Powering through his 19 song set, Wonder hit on “Signed, Sealed, Delivered,” “Sir Duke” and “I Just Called to Say I Love You.” After an amazingly powerful “We Are the World,” Williams joined Wonder. In what has to be one of music’s greatest moments, idol and superfine shared the stage. Williams was genuinely in awe as Wonder invited him to sing one of Pharrell’s own songs: “Get Lucky.” Afterward, the Jammin’ Master insisted Williams duet on mega-hit “Superstition.” For a producer and recording artist who has gone platinum many times himself, Williams seemed to revert to the little kid in his aunt’s house listening to Stevie Wonder records, totally wide-eyed with disbelief at where his career has taken him. After a cover of John Lennon’s “Imagine,” Wonder insisted that Pharrell close out the show with “Happy.” In fact, Pharrell had performed that song just two numbers earlier, but the legend insisted on a reprise. “Happy” has become a kind international anthem, a symbol of unity and the joy of life. When the hope of your mission is to make the change the world and make it a little bit happier, no other song is more apt to sum up the 2017 Global Citizen Festival.